Pick the oak leaves when they are very young and fresh; normally this will be the last week of May or the beginning of June. 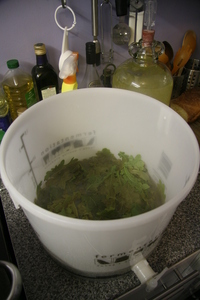 Boil the water and Pour it onto the oak leaves, leaving over night. Strain out the leaves and boil the liquid for 20 minutes, then add the sugar and orange juice and the grated rind. When the liquid has cooled to blood heat add the yeast, leave to ferment in an open bucket for five days and transfer to a fermentaion jar. Fit an airlock and leave to ferment until it stops working and the sediment settles. At this point rack off into a clean jar, add pectinol to remove the haze, leave for 24 hours and then filter the wine off into sterlized bottles and cork down with corks that have been boiledfor 10 mins. Racking number 2 for this wine. Took an SG reading of 1010 which seems rather high still. Tasting reveals it to be very very sweet. Hopefully this will kick start a bit more fermentation and get things down closer to 1000. Have given the oak leaf wine it's first racking (move old demijohn to new one) The small taste I got during the siphon didn't taste to bad. Abit sweet still. Back in the airing cupboard it goes for abit longer, see if it can ferment abit more of that sugar away. This has gone to a nice clear liquid, and is still bubbling away, all be it abit slowly. Sometime in the next week I will rack it to a new demijohn, to get it off the sediment. After leaving it to steep for 48 hours, I have now followed the rest of the recipe with the sugar and the oranges. The bucket is sat in the kitchen cooling down before I can add the yeast starter. The smell of the leaves is quite strong, the liquid is alot darker than I expected. I am left wondering if leaving the leaves to steep for twice the time in the recipe has been detrimental to the outcome of the wine. Picked a gallon of oak leaves, they have come from a selection of trees, including the small one in the pot in the garden. These have been put in a bucket with the boiling water to steap. Will then do the next stage on Monday. This page last modified Friday, 06-Aug-2010 13:15:05 CEST.